This book is an attempt to make the understanding of the Ind AS simple through lucid explanations and illustrations for each concept. The book contains industry-wise impact study, easy and quick referencer of standards, standard-wise list of exemptions and exceptions, comparison with Accounting Standards (AS), and many more. This book also contains a significant number of practical issues along with views of ITFG & Educational Materials issued by ICAI have also been duly considered while analyzing the concepts and are accordingly presented in the book. Ind AS 115 Revenue from Contract with Customers and Ind AS 116 Leases (effective from financial year starting from 1.4.2018 & 1.4.2019 respectively) are currently issued in draft form by the ICAI. Further, once these standards are issued, companies will have to make a disclosure of the expected impacts of these standards on the financial statements as per Ind AS 8 Accounting Policies, Changes in Accounting Estimates and Errors. Hence, for the benefit of readers, these standards have been incorporated in this Book. CA Anand Banka is a Fellow Member of ICAI and currently is a Director with a leading Chartered Accountants firm. Author has over 11 years of experience of accounting, audit, especially in IFRS/ Ind AS domain, including implementing IFRS/ Ind AS in companies across sectors in various countries including India, Nepal, UAE and USA. He has been involved in the accounting standard setting process, both Ind AS and AS, with ICAI. He is also a prolific speaker with seminars across various countries on IFRS, Indian Accounting Standards, Companies Act, etc. 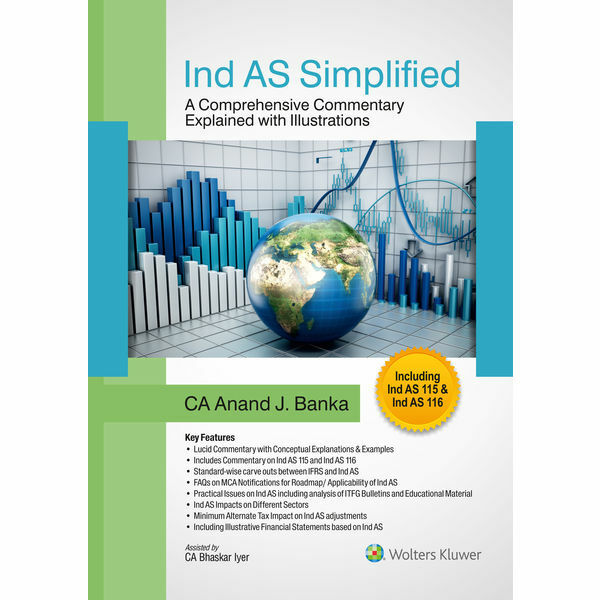 He has Authored the book “Comprehensive Guide to Ind AS Implementation” and “Comprehensive Guide to Indian GAAP” and “ Ind AS Simplified and Ind AS Simplified with Illustrations, Extracts and Disclosure Checklists, published by CCH. He is a Special Invitee on the Accounting Standards Board (ASB) of the ICAI. He is one of the best rated faculties for the Certificate Course on IFRS/ Ind AS of ICAI, across India, Nepal and UAE. He has been an “Asian-Oceanian Standard-Setters Group (AOSSG)” Trainer in Nepal for the Nepal IFRS Centre of Excellence. The Asian-Oceanian Standard-Setters Group (AOSSG) is a group of the accounting standard-setters in the Asian-Oceanian region. The group has been formed to discuss issues and share experiences on the adoption of International Financial Reporting Standards (IFRS) and to contribute to the development of high-quality global accounting standards.